This double duty Spider Web ruler creates a variety of blocks using 3 to 10 inch strips or strata widths. 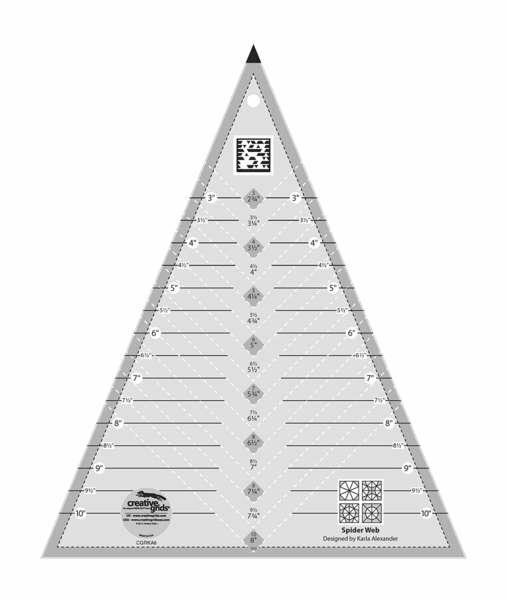 Once you have cut the triangles, re-position the ruler to cut the background kite and/or corner shapes. Depending on the positioning of the light and dark fabrics, the finished blocks resemble a spider web or a four-pointed star. The ruler slides easily over the fabric until pressure is applied. Then exclusive gripper holds the fabric in place while cutting, eliminating slipping and miss-cuts!